In the spirit of plans for an air race theme for FTFF2017 I am pulling the wrap off my intentions for a build. This means that I will not be doing a balsa build this winter but I do feel that this is an equally exciting subject. This will be a COMPLETE scratch build. No previous plans or forms. In my usual true-to-scale fashion I have done some extensive research to find the proper airfoils and I've worked out the math for the design. Wing will consist of NACA 23012 airfoil at the root with NACA 0008 at the tip. No twist in the wing as to overly complicate the stresses from a forward-swept wing. 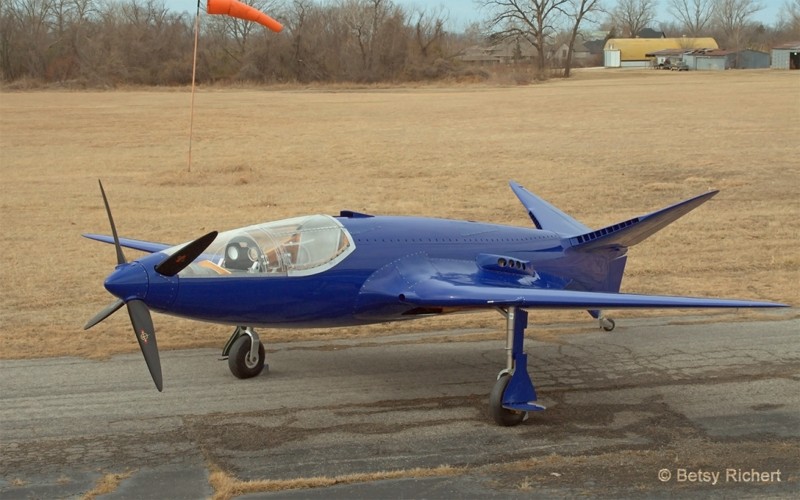 Tail will be the scale NACA 0011 airfoil. 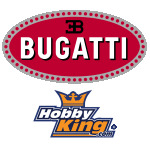 These are what is generally approximated by the Bugatti 100P project after taking careful measurements of the original. While not exact, they are proven airfoils. Dihedral of main wing measured at 7 degrees total and V-tail is at 130 degrees. Main wing incidence at 0 degrees as well as V-tail. I will deviate from true scale and not do split flaps as at this size the numbers tell me that the upper flaps will not do much for me but I will have better stall characteristics with a full flap at lower air speeds. In reality, both flaps (upper and lower) would extend down for landing anyway. The split flap design would add weight I am not willing to take a hit for. Tail planes will be aligned using a Y former made from ply to set angles correctly and better ensure tail incidence. Wing spar will be from ply and pass through the fuselage. Wings will be separate panels that will be affixed into cups carved into the fuselage to ensure proper wing incidence. Size was chosen because of a lot of convenient sizes. First, the span allows me to make this all one piece but still be a sizable model. Wheels are 3" at scale (good for grass runways) and spinner is at a convenient size as well. The canopy is small enough that I can vacuum form my own. There is also the issue of weight. At this size I can do a quick layer and carve of the fuselage and the wing thickness at the root chord is just under 2" (perfect for my pink foam technique). Everything is just sized to be an easier build. Power is TBD. I can run a single motor with no issue if size accordingly and I have ample electronics on-hand to do so. HOWEVER, if I can find the right machinist I can get a few custom parts made to include the contra-rotating props on a dual brushless motor configuration. The Himax contra motors are currently the only option at this size and honestly, they do not put out the power that I would want for this model. And they are insanely expensive. If anyone has talent in machining or "knows a guy" please let me know. Hope to do this one justice as it is a beautiful subject and sure to be quite fast. I'm going off of 3-view drawings from Louis de Monge, the chief engineer. Hope to make him proud as well. 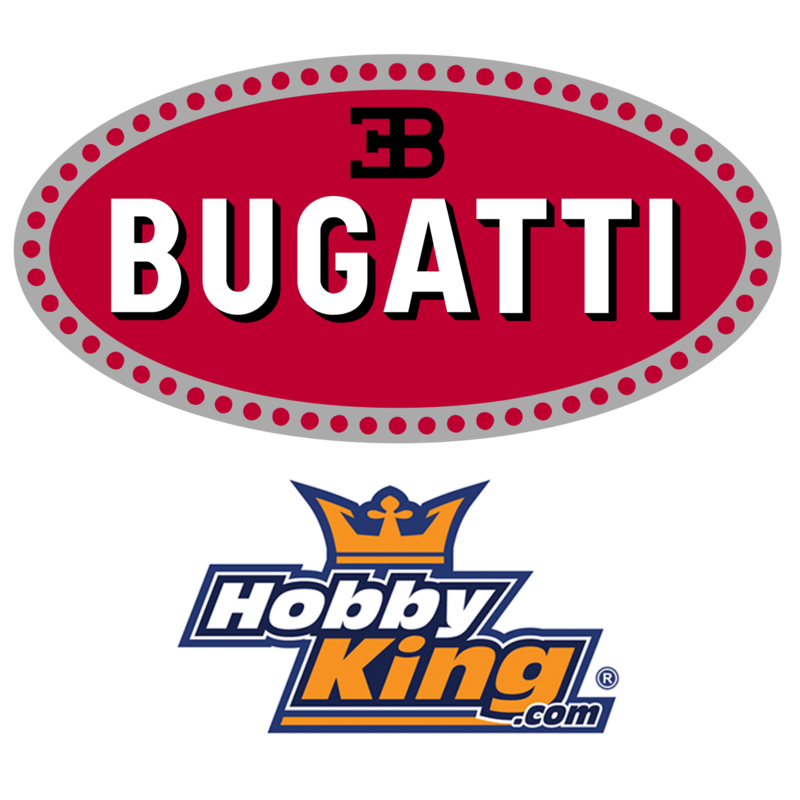 Edit 23SEP2016: Hobby King is the official sponsor of the Bugatti 100p project now. Definitely following this one. What kind of wattage to you expect to need? Oh man, I was going to build this one!!! I have to respectfully ask you to stop Joshua. Just Kidding man, good luck with this one. This looks like a monster build. If anyone is up to the task you are! This will be sweet! Good luck with the build. Maybe this RCgroups thread about a HK counter-rotating motor might be of interest. But you probably already read it. Can't wait to see the design of the counter rotating props! This is cool. I had to look it up because it looks to "space age" to be designed in the golden age... 1939! Cool. Cool subject! Here's a question on your wing - are you doing separate left/right wing halves or a single-piece wing? It sounds like you've got it planned for two removable wing halves, but wouldn't it be easier in the long run (and lighter) going with a one-piece? Or are there size constraints you're working with? Just did some youtubing on the contra rotating setups. I am betting you can put one together with minimal machining. I wonder if you've got a local maker space that would have access to milling/lathe gear. I'm going to guess 1kw or more total since it is a racer. (5lbs @ 200+ W/lb). Now if you're thinking mid engine... that is another challenge. Either way I'm looking forward to watching this one. I don't know if I would consider myself a 'talented machinist' but I have a lathe and a CNC that can handle aluminum. I would think a belt driven contra-rotating setup would be possible. I can't wait to see this build. the 100p is one of my favorite airplanes and it just looks amazing. With your talent I am sure it will turn out great. offaxis, No, I've not seen that one but I've been following this thread ever since I first considered this subject for FTFF2015. So basically 2 years ago. More on this below. David, glad to have you along for the ride!, Hope I can do enough glass work to wet your apatite! Joker, Yeah two wing halves that will plug into carved cups as stated in the first post. I'll be sure to cover this as I build but the plan is that I can just take this out of the car and fly. No assembly required. Less hardware to deal with and simpler engineering for strength. She is designed for speed and I'll be focusing on weight every step of the way to make sure she keeps that focus. Otto, we may have to talk. I can design exactly what I need in 3D that could translate to the CNC mill. The lathe work will be in the form of carving out the bell of an outrunner for a bearing. Aeronaut, I'm pretty sure it is a favorite for many folks but my hope is to not let you all down. Many things can go horribly wrong with scratch builds but I think I have enough experience doing them at this point that I will be marginally safe. So essentially I need lathe work done to the bell of the front motor to accept a bearing to rotate around the shaft. The shaft will pass through the front and back motor stators and be secured to the rear motor bell. FROM THERE, The bolt-on adaptor for the front bell would need to be drilled out on center with a bit of room to spare to allow the shaft to rotate freely inside. Ideally this would also have another bearing at the tip to help stabilize the rotation of the front bell. From there, the shaft protrudes and its a simple affair with a collet prop adaptor. The current motor I am eyeing is the NTM 35-36 1800Kv which should swing an 8x6 prop just fine on 4S. This would give me nearly 1600W of power if used as a pair... Yeah. It has a 4mm shaft and the bolt on prop adaptor has a 6mm shaft outside the threads. No way can I get a bearing at the top of this thing. BUT, If I can get the bolt on adaptor to have an overall 8mm shaft, I'm pretty sure I could find a bearing to seat at the top and have room to mill out the center without it falling apart. The problem with milling the part is that the bolt on adaptor has 3 bolts. If it was 4 then It would be a snap to just make a plate to fit over the prop and bolt the prop and hub directly to the bell. I have other thoughts. This post sort of shows what I'm after. I should also state that the plan is to have the X-plate mounts bolted together when mounted. front bell gets tapped for a big M8 bolt. M8 bolt is drilled out and prepped for bearing on each end. Bolt threads into bell and secured on the rear (inside) with a nut and thread lock. Prop is secured to the bell with another M8 nut and the protruding shaft is dealt with the same collet adaptor. I really like the simple way but the tapping of the bell has to be EXACTLY in the center. The M8 bolt would also have to be drilled out in the center in a way that would not mar the threads. With a target weight of 5 pounds I get a loading of 22oz/ft^2 and cube loading of 11.5. Lets hope I can keep that down more. Weird, just 2 days ago I was reading up on this exact aircraft and now it's here lol I need me a tinfoil hat. I take it that the primary photo on the first post is of the Carlson Designs replica? shame it crashed on the 3rd test flight just 4 days ago killing the pilot (Scotty Wilson) who had led the build project. But you can learn from that, if it's flight characteristics are anything like the full size aircraft expect if to be very floaty close to the ground at low speed (take off/landing/low passes) and lose some control authority. I thought though that Bugatti 100 (only 1 airframe built) was the civilian version built to race, the 100P was a proposed but never built interceptor version for the French air force? Ahh, nevermind the FAF version was to be called the 110P, my bad. Amazing project, subbed to this one. Good luck! Yes, the project's recent news is tragic. While my sympathies go out to the team and the families affected, this project is in no way related or inspired by theirs. Findings as a result of the project have been read and studied as a historical basis of design. Moving forward, I am leaning toward the simple option mentioned previously. I've looked into bearing sizes and I want to keep the inner shaft diameter at 4mm so I do not have to modify the rear bell at all. This means that the smallest size of bearing for the front bell and threaded shaft needs to be 7mm OD. This means that the shaft will need to be M10x1.5 threaded. I need to verify measurements but this may pose an issue with the stator on the front motor so the tip may have to be lathed down to meet that clearance level and also accommodate the bearing. I'm hopeful that the clearance will not be an issue. McMaster Carr has all the hardware I need to make the parts but I need to verify all of these measurements on the motor I have. I've included a cross sectional view of the adaptor. 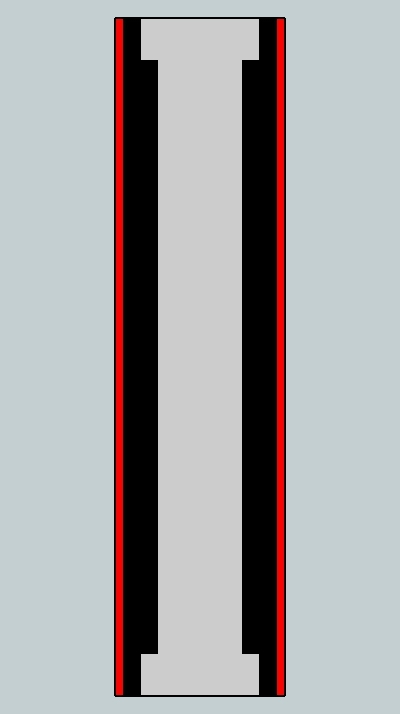 The red is the threaded section with the black being the steel. The cavities in the ends are for the bearings to seat. Edit: I found thread depth for the standard metric bolts and this would leave a wall of just 0.733mm from the threads to the bearings. I'm not sure if this would be enough of a safety margin. Very cool! I've had one of these in the works for a bit now. I might need to hurry up and get it done so we can face off at FF next year I'm shooting for sub 2lb, 40" span and 1kw power. One thing to note, your motor and prop choice is flirting with failure. That NTM is over amped even with a 7x6 on a 4s. An 8x6 would probably put you around 90a draw, per motor. I run it with a 7x7 and it's close to 80a. The motor seems to handle it fine in short bursts during a 3 min flight but it comes down HOT. Interesting Nic. I've run this motor on an 8x6 prop on 4S just fine. Just a touch over 1Kw but unloads in the air. Of course I'm flying WOT only on high-speed passes. I don't recall the current but I was running it on a 55A Dlux ESC which peaks at 67A. Many others have had great use of this motor in the configuration as well. Even if I prop back or drop a cell, I think that the thrust and speed from the contra setup will allow me to at least get over the 1Kw barrier. Also, the target 500mph of the full-scale comes down to 83.3mph at 1/6 scale. Still an impressive speed for a model of this size. 100MPH is NOT my goal. Scale fidelity is. 15v under full load isn't something you see at these numbers, not unless your battery mah is like 5000mah. 14-14.5v (3.5-6v per cell) is a more accurate range for what to expect a 2200-3300mah battery to hold under a 60+amp load. And with a single NTM 1800kv you'd be hard pressed to fit a bigger battery than a 3300, and even that would be crazy. What battery did you use during your test? When I originally tested the motor I was using a not so impressive battery and got low numbers, my poor lipo just couldn't keep up. After switching to a better battery I can hold 14.5v under full load on the NTM 1800kv and the power achieved was much greater. I just got a temp and RPM sensor for my Taranis so I'll be doing some bench testing. That with my watt meter and a scale I should be able to get a real nice data set for this motor (and others) at various prop sizes and input voltage. Thanks for the power measurements with props... I just purchased this motor to put into one of my planes and I was really wondering about it. At least I have a place to start. So, with the current draw from two motors this will be at least a 5000mAh ship. Voltage sag will not really be an issue. The pack I was using was a 2800mAh 4S pack. I forget the C rating. But anywho, I can do some bench tests, of course but they are more like synthetic benchmarks for computers. Not really practical for everyday use. The prop I used was actually a HK special. And here we go down the propeller rabbit hole. The blades are undercambered in profile... that means DRAG. They are horribly inefficient props for electric users and you will find better efficiency of your motors on other props. Equal thrust for less current draw. Further still, the material density is so high that it makes the MASS enormous for the size as well. If you can find a wood equivalent, do not even think twice. There is a reason why $20 props are on the front of my airplanes instead of $0.96 ones. Why do you think I've had motors for nearly 10 years?! And I'm talking about the high-end motors. Cheap Chinese knock-offs are fine so long as you take care of them. I balance my props EVERY time. I keep the bearings lubed EVERY season. I inspect for dirt nearly EVERY flight. Maybe its from my OCD but I will tell you right now that the prop is one of the major factors in making life easier on electric setups. Have you given any thought to using a motor with a different KV rating for the second motor? I seem to remember reading that one of the props needs to be spinning faster with a different pitch or you lose a lot of power. I'll see if I can find the article later. I think it had calculations for figuring out all the differences.